Arrhythmogenic Right Ventricular Dysplasia; Tachycardia, Ventricular. Arrhythmogenic right ventricular cardiomyopathy (ARVC) is a genetically mediated cardiomyopathy characterized by fibro-fatty degeneration and aneurysmal dilatation of the right ventricle (RV) myocardium with variable degrees of left ventricular (LV) involvement. The condition is transmitted as an autosomal dominant disease and predisposes to exertional ventricular tachycardia (VT).1 There is an autosomal recessive form of the disease known as Naxos disease, which is distinguished by palmoplantar hyperkeratosis. ARVC is a recognized cause of sudden cardiac death (SCD) in young athletes. Descriptions of the condition were reported in the Pope’s Physician in 1736.2 This described four generations of one family with progressive heart failure, SCD, and unusual pathologic findings on autopsy. Marcus et al,3 provided the first systematic description of 24 adults presenting with VT, all with a left bundle branch block (LBBB) morphology and superior axis. Further pathognomonic electrocardiographic features of the disease were described by Fontaine et al, 4 who was credited with coining the electrocardiographic epsilon (σ) wave. The diagnosis of ARVC requires the identification of major and minor criteria laid down by the working group on myocardial and pericardial diseases of the European Society of Cardiology in 1994, which was revised in 2010 [Table 1]. The diagnosis is made by the identification of two major criteria, one major and two minor criteria, or four minor criteria.5,6 There is no curative therapy for the condition given its degenerative nature. In this report, we describe a case of ARVC in a young man who was treated at a tertiary care hospital. To the best of our knowledge, this description is the first confirmed case of definite ARVC in Oman. Table 1: The 2010 revised European Society of Cardiology criteria for the diagnosis of arrhythmogenic right ventricular cardiomyopathy/dysplasia (ARVC/D). PLAX RVOT ≥ 32 mm (corrected for BSA ≥ 19 mm/m2). PSAX RVOT ≥ 36 mm (corrected for BSA ≥ 21 mm/m2). Ration of RV end-diastolic volume to BSA ≥ 110 mL/m2 (male) or ≥ 100 mL/m2 (female). Regional RV akinesia, dyskinesia, or aneurysm. PLAX RVOT ≥ 29 to < 32 mm (corrected for BSA ≥ 16 to < 19 mm/m2). PSAX RVOT ≥ 32 to < 36 mm (corrected for BSA ≥ 18 to < 21 mm/m2). Ration of RV end-diastolic volume to BSA ≥ 100 to < 110 mL/m2 (male) or ≥ 90 to < 100 mL/m2 (female). Residual myocyte < 60% by morphometric analysis (or < 50% if estimated), with fibrous replacement of the RV free wall myocardium in ≥ 1 sample, with our without fatty replacement of tissue on endomyocardial biopsy. Residual myocyte 60% to 75% by morphometric analysis (or 50% to 65% if estimated), with fibrous replacement of the RV free wall myocardium in ≥ 1 sample, with our without fatty replacement of tissue on endomyocardial biopsy. Inverted T waves in the right precordial leads (V1, V2, and V3) or beyond in individuals > 14 years of age (in the absence of complete right bundle branch block QRS ≥ 120 ms). Inverted T waves in leads V1 and V2 in individuals > 14 years of age (in the absence of complete right bundle branch block) or in V4, V5, or V6. Epsilon wave (reproducible low-amplitude signals between the end of QRS complex to the onset of the T wave) in the right precordial leads (V1 to V3). Late potentials by SAECG in ≥ 1 of 3 parameters in the absence of a QRS duration o ≥ 110 ms on the standard ECG. Filtered QRS duration (fQRS) ≥ 114 ms. Duration of terminal QRS < 40 μV (low-amplitude signal duration) ≥ 38 ms.
Root mean square voltage of QRS ≥ 55 ms measured from nadir of the S wave to the end of the QRS including R’ in V1, V2, or V3 in the absence of complete right bundle branch block. Non-sustained or sustained ventricular tachycardia of left bundle branch morphology with superior axis (negative or indeterminate QRS in leads II, III, and aVF and positive in leads aVL. Non-sustained or sustained ventricular tachycardia of RV outflow configuration left bundle-branch block morphology with the inferior axis (positive QRS in leads II, III, and aVF and negative in lead aVL) or of unknown axis. ARVC/D confirmed in a first-degree relative who meets current task force criteria. ARVC/D confirmed pathologically at autopsy or surgery in a first-degree relative. Identification of a pathogenic mutation categorized as associated or probably associated with ARVC/D in a patient under evaluation. History of ARVC/D in a first-degree relative whom it is not possible or impractical to determine whether the family member meets the current task force criteria. Premature death (< 35 years of age) due to suspected ARVC/D in a first-degree relative. ARVC/D confirmed pathologically or by current task force criteria in a second-degree relative. Diagnosis: Definite = 2 major or 1 major + 2 minor or 4 minor; Borderline= 1 major + 1 minor or 3 minor; Possible= 1 major or 2 minor. MRI: magntice resorance imaging; RV: ight ventricle; ECG: electrocardiogram. Figure 1: On presentation, a 12-lead electrocardiogram showed ventricular tachycardia of a left bundle branch morphology and superior axis. Figure 2: Post-electrical cardioversion 12-lead electrocardiogram showing epsilon waves (red arrows). Figure 3: Apical four-chamber view showing a dilated right ventricle with a basal dimension of 47 mm (normal is < 43 mm) and prominent trabeculations toward the apical segments. Figure 4: Axial cardiac computed tomography images at the level of the interventricular septum and base of the heart (a) showing fatty infiltration of the right ventricular side of the septum extending into the adjacent trabeculae (red arrow). (b) Fatty infiltration of the anterior and inferior wall of the right ventricle (short red arrow) and scalloping of the anterior wall (long red arrow). A 22-year-old male, who was a non-professional but avid football player was admitted to the Sultan Qaboos University Hospital twice over one month for evaluation and investigation of syncope and symptomatic palpitations. His past medical health was unremarkable, except for periods of violent palpitations experienced while playing football. Before the first hospitalization, there was a witnessed brief syncopal event (< 1 minute) with rapid recovery to baseline. On admission, his clinical examination was unremarkable. His baseline electrocardiogram (ECG) showed precordial T-wave inversions in V1, V2, and V3 but no other abnormalities. A quick bedside transthoracic echocardiogram was performed, which ruled out hypertrophic cardiomyopathy. A 24-hour Holter monitoring was undertaken during hospitalization and showed no significant arrhythmias. There was a six-second sinus pause noted during sleep. He was then subjected to an exercise stress test. He exercised for 20 minutes (Bruce protocol) without significant exercise-induced arrhythmias. There was an adequate heart rate response to exercise and normal recovery in the post-exercise period. He was discharged after 48-hours of observation and followed-up in the cardiac electrophysiology clinic. Two weeks later, he was readmitted with severe symptomatic palpitations. This time, the palpitations occurred after playing football and persisted. He was presyncopal and evaluated at a local health center. A wide-complex tachycardia was documented, and he did not respond to a trial of intravenous adenosine up to 12 mg. His initial 12-lead ECG at the University Hospital showed ventricular tachycardia with LBBB morphology and superior axis [Figure 1]. He was cardioverted back to sinus rhythm and treated with intravenous amiodarone. His post-cardioversion ECG showed persistent T-wave inversions in leads V1, V2, and V3 as well as epsilon waves [Figure 2]. 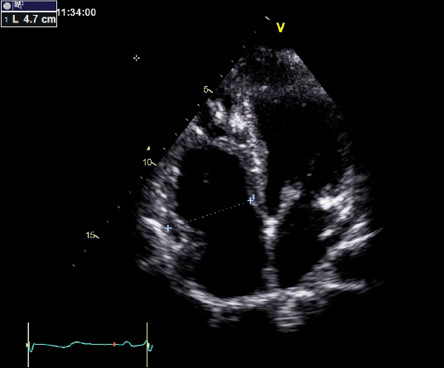 A complete 2D-echocardiogram (2D-echo) was performed and documented a dilated, moderately hypokinetic RV with prominent trabeculations [Figure 3]. Due to unavailability of facilities for cardiac magnetic resonance imaging, a gated cardiac computed tomography (CT) was performed. This ruled out coronary anomalies and confirmed the presence of right ventricular outflow tract (RVOT) dilatation. There were hypodense lesions noted on the RV aspect of the interventricular septum, RV trabeculae, and the RV free wall and inferior-apical RV wall [Figure 4]. The appearance and density was consistent with adipose tissue. There was also scalloping noted in the basal inferior wall. The patient was maintained on bisoprolol and intravenous amiodarone. He was transferred to the national cardiac electrophysiology center for automatic implantable cardioverter defibrillator (AICD) implantation for secondary prevention. His 10 siblings will undergo electrocardiographic and echocardiographic screening on an outpatient basis. In this young male, the diagnosis of definite ARVC was established by satisfying multiple major criteria. These included the documentation of sustained VT of the morphology described in Table 1 (arrhythmia criteria), the presence of epsilon waves (depolarization criteria) and T wave inversions in V1, V2, and V3 in the absence of complete Right Bundle Branch Block (RBBB) (repolarization criteria). The imaging modalities added further insight in documenting RV structural abnormalities on 2D-echo and cardiac CT. This is the first report of a case of ARVC in Oman. Our report also describes the unique findings characterizing the disease condition on gated cardiac CT, which has been gaining increasing interest as a diagnostic technique. The condition requires a high index of suspicion as it is an important cause of SCD in the young. The genetically-mediated, progressively degenerative nature of the disease has major implications for family screening. Device therapy with AICD is a cornerstone in the management for both primary and secondary preventive indications. 1. Romero J, Mejia-Lopez E, Manrique C, Lucariello R. Arrhythmogenic Right Ventricular Cardiomyopathy (ARVC/D): A Systematic Literature Review. Clin Med Insights Cardiol 2013 May;7:97-114. 2. Lancisi GM. De Motu Cordis et Aneurysmatibus Opus Psthumum. In Duas Partes Divisum. Rome: Giovanni Maria Salvioni, 1728. 3. Marcus FI, Fontaine GH, Guiraudon G, Frank R, Laurenceau JL, Malergue C, et al. Right ventricular dysplasia: a report of 24 adult cases. Circulation 1982 Feb;65(2):384-398. 4. Fontaine G, Frank R, Guiraudon G, Pavie A, Tereau Y, Chomette G, et al. [Significance of intraventricular conduction disorders observed in arrhythmogenic right ventricular dysplasia]. Arch Mal Coeur Vaiss 1984 Aug;77(8):872-879. 5. McKenna WJ, Thiene G, Nava A, Fontaliran F, Blomstrom-Lundqvist C, Fontaine G, et al; Task Force of the Working Group Myocardial and Pericardial Disease of the European Society of Cardiology and of the Scientific Council on Cardiomyopathies of the International Society and Federation of Cardiology. Diagnosis of arrhythmogenic right ventricular dysplasia/cardiomyopathy. Br Heart J 1994 Mar;71(3):215-218. 6. Marcus FI, McKenna WJ, Sherrill D, Basso C, Bauce B, Bluemke DA, et al. Diagnosis of arrhythmogenic right ventricular cardiomyopathy/dysplasia: proposed modification of the task force criteria. Circulation 2010 Apr;121(13):1533-1541. 7. Corrado D, Fontaine G, Marcus FI, McKenna WJ, Nava A, Thiene G, et al; Study Group on Arrhythmogenic Right Ventricular Dysplasia/Cardiomyopathy of the Working Groups on Myocardial and Pericardial Disease and Arrhythmias of the European Society of Cardiology and of the Scientific Council on Cardiomyopathies of the World Heart Federation. Arrhythmogenic right ventricular dysplasia/cardiomyopathy: need for an international registry. Circulation 2000 Mar;101(11):E101-E106. 8. Dalal D, Nasir K, Bomma C, Prakasa K, Tandri H, Piccini J, et al. Arrhythmogenic right ventricular dysplasia: a United States experience. Circulation 2005 Dec;112(25):3823-3832. 9. Epstein AE, DiMarco JP, Ellenbogen KA, Estes NA III, Freedman RA, Gettes LS, et al; American College of Cardiology/American Heart Association Task Force on Practice Guidelines (Writing Committee to Revise the ACC/AHA/NASPE 2002 Guideline Update for Implantation of Cardiac Pacemakers and Antiarrhythmia Devices); American Association for Thoracic Surgery; Society of Thoracic Surgeons. ACC/AHA/HRS 2008 guidelines for device-based therapy of cardiac rhythm abnormalities: A report of the American College of Cardiology/American Heart Association Task force on practice guidelines. J Am Coll Cardiol 2008 May;51(21):e1-e62. 10. Kimura F, Matsuo Y, Nakajima T, Nishikawa T, Kawamura S, Sannohe S, et al. Myocardial fat at cardiac imaging: how can we differentiate pathologic from physiologic fatty infiltration? Radiographics 2010 Oct;30(6):1587-1602. 11. Nakajima T, Kimura F, Kajimoto K, Kasanuki H, Hagiwara N. Utility of ECG-gated MDCT to differentiate patients with ARVC/D from patients with ventricular tachyarrhythmias. J Cardiovasc Comput Tomogr 2013 Jul-Aug;7(4):223-233.